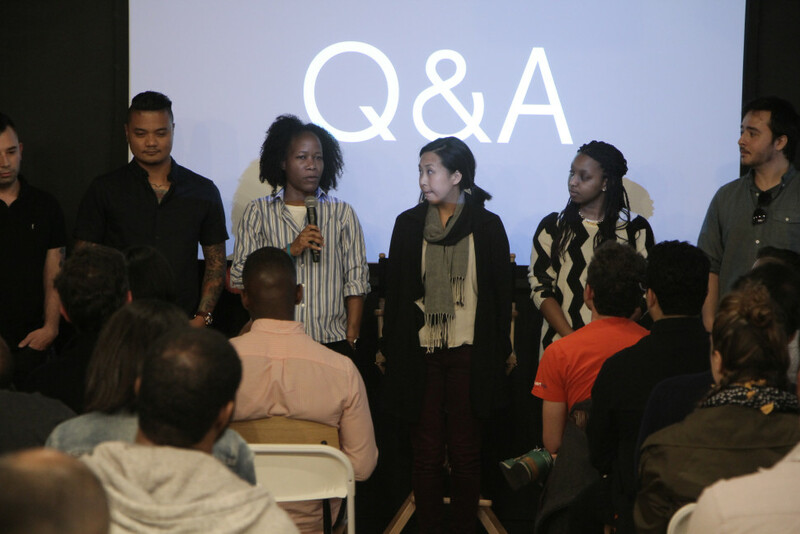 About 2 weeks ago, I attended the Techies Project Q&A at General Assembly in San Francisco. I interviewed photographer + creator of the project, Helena Price. We talked about the theme of her project, achieving and celebrating diversity in Silicon Valley. I think people are missing the point when they put people in buckets. It is not about filling the buckets and saying you've achieved a balance; it's about the value of people that come from different places. Knowing that people come from different places and have different life experiences can inform the products you're building for the world. Ripple News has merged with Hoodline, therefore their site is down. The following interview has been pasted here. Meet Helena Price, a techie-turned-photographer, who’s stirring up conversation in the tech world. Having worked at companies like SkillShare and 1000memories, she quit in 2013 and started shooting commercial photography. Fast forward to 2016 and she is in the spotlight for her recent work, “The Techies Project,” which addresses diversity issues and aims to celebrate the underrepresented who work in this industry by sharing their stories. Josephine Tse: What was your motivation and inspiration for taking on “The Techies Project”? Helena Price: I've been wanting to do a project like this for 10 years. I'm really into the idea of the power of photography, storytelling and the idea of collecting human experience to help other people learn and make their own decisions. When I worked in tech for several years, I had a huge depth of experiences, both positive and negative, so that fed a lot into my project. In December 2015, the idea came to me where I was like, "Ok, I think it's time to do this project. I have the resources and the time to do it, and I think I want to do it on the tech industry, because it's in a weird place right now and it needs to be explored." JT: Before you started doing “The Techies Project,” did you have any preconceptions as to where this project would lead you? HP: I tried to be really open. I definitely had ideas, like I followed tech culture and conversations around diversity inclusion really closely on Twitter. I had my own experiences to draw from, and those from the industry who've had similar experiences to me, so I had some expectations for what I might learn, but I wasn't totally sure what would come out of it. I left it really open ended to see what I would learn from 100 people and then drew some hard conclusions from there. JT: Was there anything especially surprising that you learned? HP: Surprising is a strong word, but there are abstract concepts you hear that start to make sense to you. For instance, the idea that venture capitalists only invest in problems and people that they can relate to. You hear that once, you think, "yeah, probably." But then when you hear it over and over again through the lens of so many people's different experiences, it becomes way more profound and takes on this whole new meaning. JT: What have you learned from conversations after you stopped pressing the record button? HP: People were really open when I interviewed them. We got a lot out when the record button was on, which was incredible. But I think for me, the little moments after the fact where people were telling me how much this means to them. Or how it's pretty scary to be vulnerable in this way, but they feel really excited to be apart of an initial movement in this way. Or sharing their inspirations of why they applied to the project in the first place. Those moments were amazing fuel to keep working and making it happen. JT: There have been criticisms I've been reading on the internet about this being a project that shows the most privileged of 'diverse' in tech — a 'rich people project', essentially. What are some of your responses to this? HP: That's interesting, because it makes me think they didn't read the project. Most of the people didn't come from money; a lot from extreme poverty, from other countries and grew up in immigrant communities and illegal immigrant communities. But they're doing well now because they worked their way up in tech companies in Silicon Valley. And if they're assuming that I'm super rich, I guess they haven't read anything about me. I did this project because people make assumptions based on what they want to think. JT: I was reading your profile on Everette Taylor. He was talking about events where the organizers would have white women there and call it diverse. But he didn't see people that looked like him, and that bothered him. Do you find people who aren't at all part of that minority conversation, maybe because they're harder to identify? HP: Yes, and I think it's a huge issue what Everette talked about. That isn't true diversity. True diversity is cognitive diversity, and people from all different places, socioeconomic backgrounds, ages, hardships and disabilities. When I approached this project, I was really trying to focus on covering as many bases as possible. It was important for me to not just focus on percentages of women or people of color, but on what are really unique experiences that don't put people in buckets and showcases that everybody is from a different place. JT: Buckets exist because they're easily defined, but the grey area that exists is hard to measure. HP: I think people are missing the point when they put people in buckets. It is not about filling the buckets and saying you've achieved a balance; it's about the value of people that come from different places. Knowing that people come from different places and have different life experiences can inform the products you're building for the world. JT: On the note of having diverse teams leading to better business and product outcomes, it seems like it’s not only morally correct to be inclusive, but it makes business sense. It feels like the answer is right there, but why is it so hard for companies to change their mindset and perspectives? HP: I mean, the answer is and isn't right there. The conversations are happening, but they're in this echo chamber. People that need to hear it the most aren't paying attention to that. They're running companies, they haven't experienced discrimination, they haven't gone through it themselves so they don't know it exists. JT: What has been an outside the box solution you've heard from people about how to tackle these diversity issues in the workplace? H: That's a tough one to think about! I mean, I've heard a thousand different proposed solutions, so it's hard to pick one. What has been the most interesting to me is seeing that everybody has their own solution proposal based on their own experience. We only know what we've experienced, so it's important to get all these different perspectives where our ideas of how diversity is solved is only through our own lens of what we've been through. But if we can learn about what 100 or 200 different people have been through, then that changes our own perspective. It helps us figure out how to not only improve things for ourselves, but for everybody. JT: As you continue to work on “The Techies Project,” let's say theoretically you're still doing this in 20 years. The kids are in kindergarten — what kind of stories do you think they'll tell you? HP: I don't think I'll be doing this in 20 years, but (laughs) hopefully in 20 years, kids will have better access to technology. My biggest fear is with this gap — for the kids these days that don’t have access to tech and people who are not of a certain pedigree or type, the gap just gets bigger. That's the biggest fear. If we don't start working on this now, the gap might be so big that we're like robots but then the rest of the world is super behind. JT: What do you think needs to happen in this industry where we reach a culture where these obstacles for minorities doesn't have to exist anymore? HP: The major first step is awareness. That is still an issue — there are still people in tech that have no idea these issues exist. They've never heard of my project or anyone else's projects. It's just never been a conversation for them and that's crazy. Figuring out ways to make this message interesting and relevant to those people are important. We can talk about it amongst ourselves all that we want, but it's a matter of getting people who aren't affected by it, inspired by it. And that's the big challenge.